Here’s a look at a very interesting set I picked up at CVE Toronto at the recommendation of our very own Pornplaysmusic aka Pat of Campbell Coils fame. He explained how he was a really big fan of their very authentic tasting fruity flavours so I stopped to check them out. The company is called Symbiosis and they’re based out of Quebec but luckily their products appear to be readily available online so there shouldn’t be any issues getting a hold of them. After meeting with them they were kind enough to set me up with a set to review and I’m so very glad that they did. Here are my honest thoughts on the Tayst line from Symbiosis. My thoughts: This is likely the darkest flavour of the set with the blueberry and raspberry giving it a slight dark berry slant before the bright and tart lemonade kicks in. When I crack the bottle the blueberry is the first thing I smell and also the first thing to hit my taste buds when trying it. It’s more a natural blueberry then say a jam or anything like that. With blueberry it can often have a slight floral tinge to it but I don’t really get one from Lick, just a nice light blueberry flavour. The raspberry is fairly light and blends well with the blueberry and thankfully doesn’t turn this into a blue raspberry sort of thing. With the two berries combined it comes off as a dark berry blend that’s light and refreshing, a little bit sweet and a little bit tart thanks to the addition of the lemonade. That little bit of blueberry in the mix is what really takes this from beyond a regular pink lemonade and like I mentioned it gives is a much deeper, darker taste but thanks to the citrus of the lemonade it’s still bright and refreshing. The lemonade gives it a nice tart taste but doesn’t come off too sour and is really more refreshing than anything. I do get a slight hint of candy on the tail end thanks to the berries but the tang of the lemonade helps keep it from being just a sweet candy flavour. Fans of berry blends and lemonade will want to check this one out!! My thoughts: This one was my absolute hands down favorite of the line. I’ve always been a huge fan of honeydew flavours but finding a good one has always been a challenge. I do have a few that I regularly pickup but for the most part I don’t come across too many that I’d add to the rotation. Savor easily made it in to the regular rotation after just one taste. The honeydew is the most forward in the profile and it’s nice and sweet with that classic green melon taste. The soursop which isn’t the most common fruit adds a nice tropical note to it as well as a touch of creaminess. If you’re not familiar with soursop it’s a fruit that’s native to the tropical regions of the Americas. I’ve seen it pop up in a few flavours lately but it’s not something I’ve had a lot of experience with in person. I’ve heard it described as a cross between strawberries, apple and citrus with a coconut or banana like creaminess and texture. I’ve also heard it described as pineapple, banana and papaya so interpretation can obviously vary. It’s often referred to as guanábana or graviola and although I’m not all that familiar with the actual fruit I found it’s a very interesting and tasty addition to the flavour. It definitely gives it a slight tropical twang that wouldn’t come from the honeydew and kiwi alone and maybe adds a bit of thickness giving it a slight creamy taste. The other note in the mix is kiwi but I’d be hard pressed to actually pick any up in this blend. Unlike many other kiwi flavours it really isn’t all that tart and comes off more creamy then anything thanks to the Soursop. To me it’s kind of a creamy, sweet honeydew flavour and it reminds me a bit of the honeydew milk tea I get from the Bobba tea shop down the street. 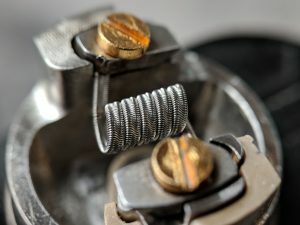 Super tasty and something I have no trouble vaping on all day long!!! My thoughts: This set had several eye opening moments and with Bite I definitely had one. It’s another interesting mix of bright fruity flavours that’s a bit different from all the other average fruit blends I’ve tried. It’s a super juicy mix of juicy peach, deep blood orange and a lightly tart passion fruit. The blood orange is the most prominent flavour in the mix slightly overtaking the peach and passion fruit but it’s incredibly real tasting and absolutely delicious. If you’ve ever tried a blood orange you’ll recognize the flavour as a very round sweet orange without as much of a citrus bite to it. I find it’s usually a bit sweeter as well with a distinct but slightly different orange flavour. While the juicy peach does compete with the blood orange for attention it definitely comes through as a bright juicy almost over ripened peach flavour. I don’t get any of that fuzzy peach candy taste just a sweet juicy and natural tasting peach. The passion fruit however really changes the taste and texture of the flavour giving it a bit more body and depth but not taking away from the lead flavours. It’s a hard to describe flavour that’s sweet but also tart and often has a sort of perfume to it. While Bite doesn’t quite pick up the perfume aspect of the passion fruit it definitely adds some of it’s unique tropical complexity. This one will definitely be one to check out especially for fans of orange or peach flavours!!! My thoughts: This one might be the most basic of the bunch but that’s not to say it isn’t good either. It’s a fairly average mix of strawberry and watermelon but where it gets a bit more interesting is the addition of a little guava. The strawberry and the watermelon are actually pretty fairly matched and almost battle it out for attention up front. They’re both a bit on the sweet side so it’s kind of hard to figure out which one actually wins out. At times I taste a bit more watermelon whereas other times I’m left with just sweet strawberry. Both are fairly sweet and just the littlest bit artificial tasting which is pretty much par for the course with both of these fairly common flavours. The guava on the other hand finishes this whole thing off and gives it a sort of thicker feel with just the littlest bit of tartness to it. Compared to the others this one is just a bit more common place on account of the strawberry and watermelon which are pretty ubiquitous in the industry but at least the guava gives it a little something extra. It’s not quite tropical even despite the guava as the watermelon and strawberry really make this one more of a sweet juicy flavour as opposed to an exotic blend of tropical fruits. I think any fans of strawberry and watermelon flavours will appreciate this one and despite it being a bit on the sweet side I still quite enjoyed it! I have to say I was very much impressed by the entire line from Sybiosis. Each one of them is very well crafted and really pop with flavour without being overly sweet or tasting of artificial chemicals. 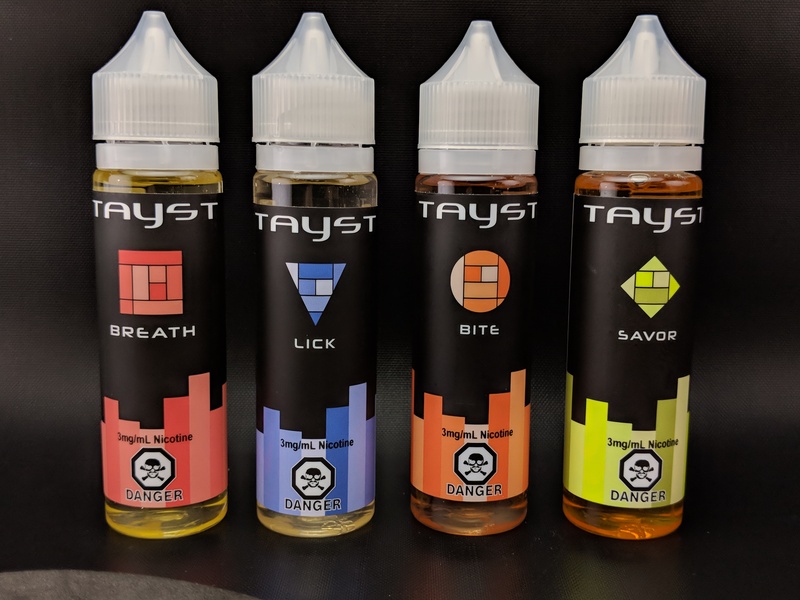 I think I’ll agree with Pat and say these are some of the best fruity flavours I’ve tried in quite some time and the line offers a decent amount of choices for fans of fruity flavours. The prices are a bit high on them but as much as taste is subjective cost is relative so I’ll leave it up to you to decide if they’re worth the additional cost. So huge thanks to the gents from Symbiosis for setting me up with the set, you guys make some spectacular juice! !